Only four female singers made it through to the top 12 in the competition. "The Voice" got its top 12 at the end of a special one-hour live show Thursday, and as the results showed, boy, is it a man's world. But before whittling the show's final 20 contestants down to just 12, all of them had to sing for their chance to stick around. Team Blake kicked off the night with an energetic take on the classic rock standard "Free Ride." The show's two bearded, gravelly-voiced men, Austin Jenckes and Cole Vosbury, jammed on guitar. Nic Hawk and Ray Vosbury, flanking Shelbie Z., traded funky and bluesy vocals, while Shelbie added her own twang. But afterward, things got serious. Austin and Cole both were announced, to their relief, to have garnered enough votes to stay in the competition. That left Blake, fresh off the CMA Awards Wednesday night, with the tall task of deciding which one would join them, and which two would go home. "I hate this part of the show," he admitted, but he said he had to go with his gut and chose Ray to remain on his team. That meant it was the end of the road for Shelbie, Team Blake's lone lady, and Nic, who said he was just grateful Blake had given him a chance at all when he stole him from Team Adam. Next came Team CeeLo, performing a '70s rock tune of their own, a languorous rendition of the Supertramp hit "Give a Little Bit" — with Jonny Gray warbling, Kat Robichaud hamming it up in red hot pants, Tamara Chauniece going gospel and Caroline Pennell and Amber Nicole dancing happily. 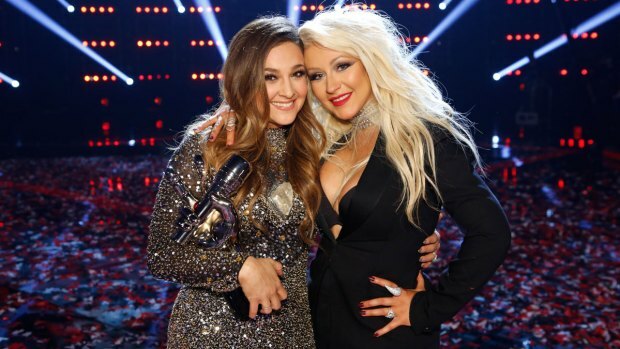 But the eliminations were another story, as the team's youngest two members — Amber Nicole and Caroline — mouthed "I love you" to each other nervously. Caroline, with her pixie-like voice and ingenue charm, was first to breathe a sigh of relief when Carson called her name. Next came Jonny, the team's lone male member. "I love you all equally," CeeLo told the unlucky remaining three. But after dispensing some sage CeeLo advice, he picked glam-rocker Kat to stick around, which meant Tamara and Amber Nicole were leaving. Next, Team Christina took to the stage, covering not a classic rock song but a Maroon 5 song, "Love Somebody." The five unique singers pranced around the stage as they belted and crooned their lines, and the song's dad Adam seemed to enjoy it. Then, with Jacquie Lee seeming to be laughing and crying at the same time and with Stephanie Anne Johnson giggling nervously, it was time for eliminations. Jacquie, the competition's youngest singer, was the first to be saved, followed by Matthew Schuler — both of whom had turned in perhaps the team's strongest performances Tuesday night. That left Christina with a tough decision and what turned out to be a very long, very rambling speech to make. "I've really gotten to know each one of you, what makes you tick, what you guys like, what makes you fired up," she said. "I care very much about each one of you." Finally, however, she chose Josh to stay. That meant Stephanie Anne and Olivia Henken were heading home. Team Adam closed out the night with a performance of the Capital Cities hit "Safe & Sound," its members — especially Preston Pohl and Tessanne Chin — hitting upon vocal chemistry in their call-and-response lines. The first member of Team Adam to be deemed safe was one of its most unassuming — but also the member who got perhaps the most over-the-top praise from the coaches Monday night: College dropout and self-professed geek James Wolpert, who looked shell-shocked as he got the news. Jamaican diva-without-the-ego Tessanne Chin's name was called next, and when it was, she covered her face in her hands and wept. Adam seemed to waver as he considered whom to pick to keep on his team, but when he finally settled on his pick — warning it might be "surprising" — it was Will Champlin, the singer he'd cut from his team only to steal back from a rival. Preston and Grey, then, were heading home. And with that, season five of "The Voice" got its final 12 contestants — and eight of them were men, in a sharp reversal from last season. "The Voice" begins narrowing the field of singers this week, with America's help. The live elimination shows will thin the field of 20 singers down to just 12. The first ten competitors will take the stage tonight. "The Voice" live shows continue next week with more performances, and more eliminations. "The Voice" aires Mondays at 8/7c and Tuesdays at 9/8c on NBC.